There were very few housing starts in 1933, the heart of the Great Depression. In Wilmette, there were only a handful of residences constructed that summer--and this Sears Milford was one of them. 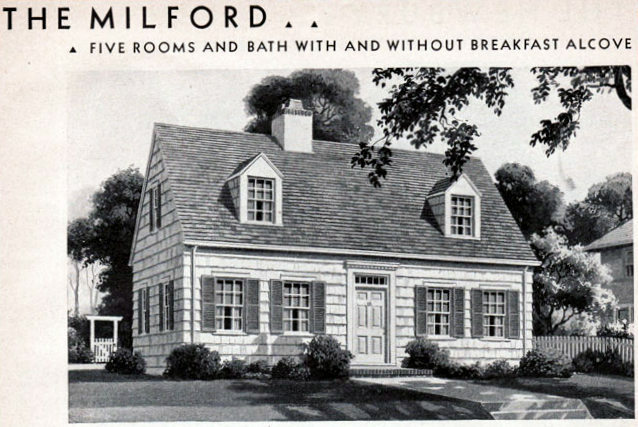 The Sears Milford, from the 1936 Modern Homes catalog. The Milford in Wilmette was constructed for a cost of about $10,000. The house has a brick veneer facade rather than the standard red cedar shingles. 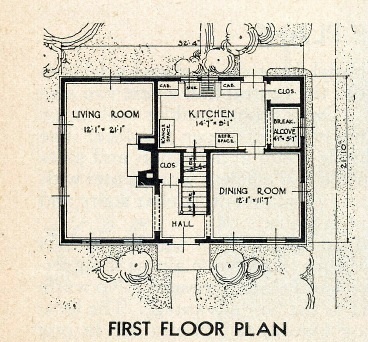 The Milford had two floor plans. The house in Wilmette has the larger floor plan with the breakfast alcove. The architect of the Milford was Alexander H. Bacci. The original owners were Robert A. Simon and his wife, Irene. Robert worked for the Cooter Brokerage Company in the Merchandise Mart. The Simons owned the house until at least 1972. The Milford recently sold for $815,000. Holy cow, what a find. It seems like there are houses everywhere that resemble this look-- it's another style that makes my eyes glaze over. Great work.